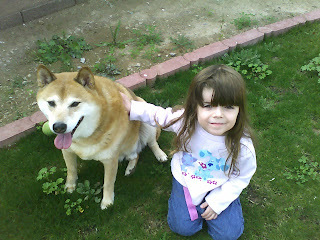 "This is my niece Ashley who Loves Kuma as much as I do, we walked around the corner to her house today and he was in heaven,her yard is three times the size of mine. They played together for about an hour, he had a great time and he was a good boy with her.It's very cute she is going to be 4 she will tell you his name and also tell you his breed, she loves Kuma. The other day they were watching the Dog show and she kept telling her sister wow look at that dog he looks like Kuma and did that a few times and when my other niece said look at the terrier that just came out Ashley said "Amber ,Kuma is not a terrier he's a Shiba Inu." What a cutie Kuma is! My shiba's name is Kuma too! http://www.squidoo.com/shibainu/ I think it's a great name for them! !